Nepal's best tour package includes sightseeing in Kathmandu and Tansen and sightseeing and adventure activities in Pokhara and the Chitwan National Park. Kathmandu is the city of culture, tradition, old royal palaces, temples, stupas and monasteries that can be visited throughout the year. The amazing art and architecture in the temples, monasteries and the old royal palaces in Kathmandu Valley always welcome and attract the visitors. Tours around the Kathmandu Valley and Pokhara are not very exciting for the mountain lovers in the monsoon as the beautiful snowcapped mountains cannot be viewed from the popular viewpoints due to the fog. 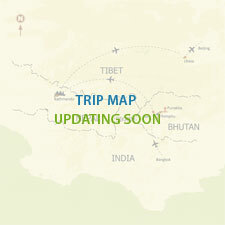 The best seasons to tour around the Kathmandu valley and Pokhara are September -December and March -April each year. Mountain flights are the best options for tourists to view the beautiful Himalayas. The regular one hour mountain flights from Kathmandu approach very close to Mt. Everest and other beautiful mountains. Pokhara, the city of natural beauty, is another paradise for tourists to visit. Boating in Phewa Lake and Begnash Lake with the view of Annapurna Himal and Fish Tail (Macha Puchre) Himal are really amazing in Pokhara. There are many adventure activities, including Paragliding, Zip flyer and Ultra Light, for the tourists to enjoy. The Chitwan National Park is full of adventure and very rich in flora and fauna. It is a home of 43 species of mammals, 45 species of amphibians, 500 species of birds in addition to one-horned rhinos and Royal Bengal tigers. The cost of the package depends upon the number of Tourists,standard of Hotel and requirement of facalities. Day 02: In the morning drive to domestic airport for mountain flight -one hour spectacular mountain flight-drive back to the hotel and breakfast. Day 04: Breakfast-drive to Swoyambhunath and sightseeing-drive to Pokhara. Lunch is provided on the way in a beautiful restaurant and first day we do boating in Phewa Lake. Day 05: Early in the morning drive to sarangkot to sun rise and beautiful snow mountain and drive back to hotel. After breakfast start sightseeing and visit Binde basini temple, Devid’s fall, gupteshor mahadev cave and Tibetan refugee camp. Day 07: Breakfast-drive to Chitwan National Park and relax in Rapati River to view the sunset with dense forest. Day 08: Breakfast-jungle activities in the Park.In Chitwan national park the following activities are included. Canoeing trip, Jungle walk, Elephant riding, bird watching, Tour to elephant breeding center,Tharu village tour, Thau village and Tharu museum tour and culture program.